The Constitutional Court has maintained that the 64 ministers who stayed on in office after the dissolution of Parliament in 2016 must pay back the money they received during the period they illegally occupied their positions. The ruling was made on Friday after the court dismissed Attorney General Likando Kalaluka’s application in which he wanted the court to revisit it’s ruling that the former PF ministers must pay back the money they obtained during the time they were found to have occupied their offices illegally. But the ministers, through Attorney General Kalaluka, applied to re-open and review the judgment, and vacate the portion where it directed that they refund the emoluments they got. A panel of five Constitutional Court Judges made the ruling which was delivered by Judge Margaret Munalula and dismissed Kalaluka’s application saying it was against public interest that he was seeking to represent the ministers. The court said the status had changed after it was found that the ministers occupied their offices illegally and therefore, Kalaluka could not represent them as it was now a private matter. In this matter, the Law Association of Zambia and the opposition UPND sued former Justice Minister Ngosa Simbyakula and 63 others for illegally serving in the government after Parliament was dissolved. The Constitutional Court on August 8th 2016 declared that Ministers occupied their positions illegally after Parliament was dissolved and ordered them to pay back the money and vacate their positions immediately. And political activist Macdonald Chipenzi has described the ruling as exciting. He said it is also exciting that the judgement has observed that Attorney General had no right to represent private persons in a case of this nature. He said the Chingola, Siavonga township roads are in dilapidated state including the Tbz-Kaoma road, katunda-Lukulu road, Kafue-Mazakuka road are all yearning for rehabilitation adding that this money can go a long way to address their current state. “Whether broke or not, we want our money back please. brokenness is secondary in this matter,” he said. Open Letter: Why President-Elect Lungu must Vote Yes for The Concourt Midnight Decision! State house will pay for them. Especially those who job seekers now, like abena Monde. How old is this case again? This is bad verdict. They are all sick greedy people…former Justice Minister Ngosa is now enjoying dollars in Washington in the Embassy!! Bet he’ll be the first one to pay back even though he’s morally upside down. And why and how where they left to overstay? You ask that question now…when Lazy Lungu is the one who was defending them. You saw those articles on LT and you commented on them today you come and ask daft silly questions without absolutely any shame. 4 years from now you will ask how Edgar was let to rule…really laughable. Now lets wait and see if the this court does have the power to enforce its judgement or it is one of those that will last over 10 years? “I am as clean as Kaunda s Handkerchief” Who said these words? Manje’ blind staunch P.F Cadres like BR Mumba na ka Nubian are beginning to speak some sense, despite them being the defenders & enablers of this PF banditry & stupidity. Is it because they’ve now realise their Master “Drunkman Pombe;” is NOT wamuyaya after all, from the Zimbabwe situation. If Strong despots like Bob Mugs can one day be vulnerable, what more Pombe wamawaya – (made from wires)? Like Jay Jay says ka Nubian was part of the cancer that was cheering all P.F wrongdoings without analytically evaluating the nonsense they spew, & now it pretends to be all rational & reasoning, atase!! raised their Pangas for Chagwa @ Mulungushi Rock!! @Mr Toilet Kambwili this is utterly unacceptable! Why do you want to denigrate a fellow citizen (who you probably have never met) in this manner? Has he become your stepfather? Come-on you can do better than that! They used GRZ fuel too! Who isn’t going to calculate what they owe in totality? They also used GRZ property for campaigns. Was the election free and fair? Pay back the money. Why did this case even go back to the Concourt? It’s a useless ruling if this useless court can’t impose a timeline or a deadline by which they should pay back. When? How much? Who’s going to verify that the correct amount of money has been paid back? Talk about academic ruling just to save face. They are all political stooge trying to hoodwink the public that they are independent, only to come up with some favourable rulings in Lungu’s favour on key issues like a 3rd term bid. Why are they even fighting the original ruling? Are they broke or just corrupt? Thats African politicans for you…this is a PR disaster that should have been swiftly taken care of ….but then again once these fooools are elected they are untouchable!! If I was BUFFOON CK I would be the first one to write out a cheque but we know that during this period these crooks were campaigning hence these foools ran up hefty bills and allowances. Maybe the foool thinks it is payback for that one month suspension slapped on them by the speaker!! Every case is judged on its own merits…thats third term bid is a whole different matter. Think very carefully. There is “illegal” precedent already in this case. Just consider lenght of time it has taken ConCourt to deliver ruling. Next month there should be ruling on third therm. Coincidence or “repetition of sweetener”? It looks that Spaka got it right. Exactly Jay-Jay. Let’s celebrate for Justice in this instance has suddenly prevailed. This judgement was handed down last year already,its not a new judgement. However, as you have seen it was contested pending review and thats what has recently been thrown out as well. This is no special treatment, any party is free to appeal or seek review of any decision of the court. I agree with Jay Jay, every case has got it own merits, its no rocket science and we should judge these Judges by the merits of the case and not just blanket them as corrupt. Fair. And case closed! Even if the donkis say anything. It is fair and lets move on. If one half of the country is full of donkeys then so is the other half. @spaka like lilo:kikikikikikiki …..so you know that your Kalusa (HH) will face CROWD PULLER (ECL) in 2021 Ka? Be strong ba upnd!!! You just dont know who makes upnd to lose elections! !GET IT FROM US -ITS YOUR HH! !upnd under Mazoka could have won the presidency long time ago even before Michael Sata won it.There are 4 factors which make HH unvotable especially in 6.5 provinces,i.e; (1)TRIBALISM,(2) ARROGANCY,(3) PRIVATIZATION and now (4) TAX DODGING (paradise paper leak)! !The upnd PR team has much work to do to make HH votable across Zambia! !AM PRETTY SURE THAT EVEN IN 2021 THOSE 4 MAJOR FACTORS WILL COST HH THE PRESIDENCY FOR A RECORD 6TH TIME!! !whoever will stand on PF shall easily defeat HH!!! Iwe kaponya who cares about upnd or hh ?? And the crowd puller you mention had just spent 17 billion and used all the violence and illigalities to bribe and pull those crowds you dream of and still only had a margin of 100, 000 stolen votes ….that is pathetic……hear this, and hear this well , without violence , brutality and illigalities lungu can not win any election…….he needs illigalities to win anything. Ah ok so Dr CK will be the first one to pay because he is pro poor and the future of those who follow him also the Ambassador to the US being a lawyer will follow the law and pay back to the coffers and how come this wasn’t captured in the Auditor Generals reports???? …and so they must!!! The PF top brass already agreed to pay this money back. Straight forward matter that shouldn’t put 1.d.iots like Chimpanzee Mcdonald in a heightened state of excitement. Just pay back badala….lungu as a lawyer should know what is illigal, one would hope but alas the man has a speciality of operating in Gray areas and reinterpreating Gray areas that boarder on criminality…..ishhh…lungu , lungu. Is there no integrity in lungu ? From the the petition , 42/42 right up to the AGs report of unprecedented abuse of public funds under lungu the public are even starting to think stealing and corruption is part of a job and is a normal thing to do….. Ministers who overbilled for the $42m fire truck tender must also pay back the funds overbilled by their shady business partners. And you are exception which confirms rule. You are in serious pain! the difference could have been huge in 2016. In 2015,the difference was about 35 000 then in 2016 above 100 000,come 2021 it will be more than 500 000 votes in favour of PF-mark my words! !plus PF officials will pump in huge somes of money in campagnies from their chinese sponsors! !politics is expensive,so if you cant beat them,then just join them!!! THE FACT IS WHOEVER WILL STAND ON PF WILL BE THE FAVOURITE TO RETAIN POWER IN 2021 AS I SIMPLY CANT SEE HOW HH CAN WIN IN THE NORTH AND EAST.visit the North and East so that you can see how unkown and unwanted your HH is in those areas! !same,PF cant win in the South,West and N/west because many bantustans hate PF with a passion! !THESE ARE FACTS!! ONCE MORE MINISTERS PAY OUR MONEY BACK-DR GUY SCOTT TOO!! It’s only your stealing mother and father who voted lungu naiwe….after spending 17 billion the fraud convict still had to get accused of stealing votes…..even the topic at hand is about him stealing public funds …..this time round there is no 17 billion spend…. Spare a thought for the likes of Greyford Monde when the bill arrives though the post…the boy’s highest qualification is a G12 certificate and I don’t think his people down South will ever forgive him!! Good, PF are by far the dullest government we have had, just behind RB’s MMD. Let these crooks pay up. For those who are still ministers jus stop paying them. Those who are not send belifs to get their property. These guys have money. CK can even boast of going to London every morning just to have breakfast. Yes he can – stolen cash! Why has it taken so long for concourt to deliver a ruling on an blaitant simple case ? Is this ruling in relation to the expected ruling of lungus 3rd term bid that is imminent ??? A sweetener perhaps so the public do not cry foul over the 3rd term ruling ??? 18.1 Spaka like something, please spare a thought for U5. He needs the votes from the 6.5 provinces, now referring to those voters as “..your stealing mother and father who voted for Lungu…” is not the best way to convince or convert those votes to U5 is it? Mr terrible you and the other PF caders got it all wrong…..i do not care about your so called u5 I do not care about UPND. To me the issue is lungus continued breaking of laws and lack of integrity and of course his abuse and degradation of Zambians once illustrious democratic credentials. I don’t care who challenges lungu , right now anybody can be a better alternative to lungu that is for sure…..i stand for integrity and high morals for our youth to emulate not this chawama pit latrine integrity lungu has brought to state house. …these up.ndonkeys eissh no strategy for wooing votes…. they only think in a tribal band…the rest of Zambians are either bemba monkeys or eastern rats and yet they need those votes. Well never mind, since when did a donkey rule anyone, even if they wanted to? FYI I am an easterner like lungu and should be wako ni wako but I care more about Zambians future then your dirty tribal politics of looting and corruption.. ….to me the issue is rule of law and good governance…as practiced by lungu for us to follow. Now let’s talk about the up.ndonkey convention where at least U5 can pretend to have been “re-elected” to lead his family party. What do U5 and Charles Kakoma donkikis mean by holding the convention “at an appropriate time”? Let me remind them that there is no such thing as an appropriate time, their constitution requires conventions EVERY 5 YEARS and so far they have illegally neglected 2011 and 2016. So U5, Gary, Jack Mwiimbu, Charles Kakoma, Stephen Katuka ate illegitimate leaders who are either overdue electorally or have been appointed by illegitimate “leaders”. Badala the topic is of lungus stealing and looting , not u5 and UPND stop trying to deflect public attention. A statement from the great leader lungu on this matter would be nice…..even an open press conference badala to address the many burning issues……would you not agree ? Concourt, tell us wat will happen if they do not pay? what is the implication of ur verdict?A felon has been committed proved by the courts beyond reasonable doubt and yet the suspects are moving freely. @23.1 Spaka like sensible, that is good to hear that you no longer care about U5, all that you want is integrity. I see that you have paraphrased my previous statements that any bad leader cannot be worse than U5. I rest my case…….happily. As for President Lungu’s democratic credentials, I will let eminent persons speak for me: BBC’s Stephen Sackur, outgoing US Ambassador Eric Schultz, Commonwealth SG Baroness Patricia Scotland etc. Please consult them. 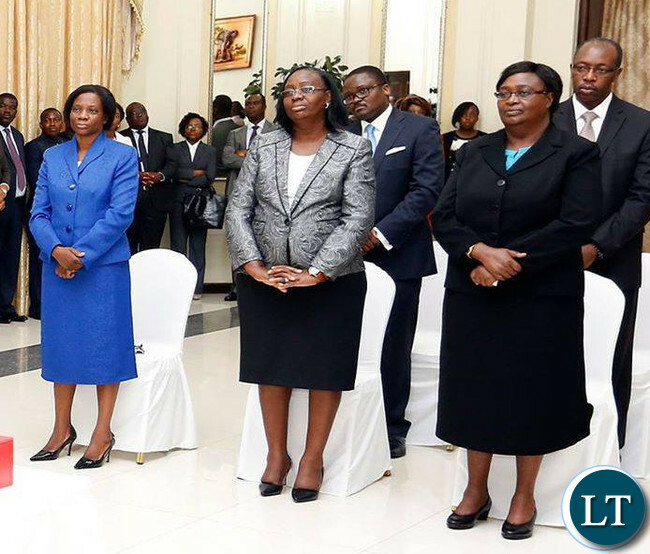 Do not believe ZNBC badala…..lungu is seen as a corrupt wannabe dictator. @Spaka like lilo:where have you seen president Edgar Lungu stealing?which medium has ever implicated ECL since he won the presidency in 2015?dont talk from without. People say HH stole our money via privatization with FTJ Chiluba.facts are there and the “paradise paper” confirmed it a week ago too.HH fails to explain how he got rich,a clear sign that he stole through privatization when he under valued state assets,in the end sending a lot of miners to an early grave.ALL ZAMBIANS KNOW THIS FACT!!! so if you have nothing to say about ECL,you better shut your big mouth!! !painting ECL black wont stop us majority Zambians from voting for PF in 2021 because PF is in our blood just like upnd is in your tonga blood!! COME 2021 NI PF NAFUTI NAFUTI!!! Hh should be investigated and arrested for the privatisation money badala…..and it is not me saying lungu is a corrupt theif, I am only repeating what has been said by kambwili and others in the media that lungu is a corrupt theif…….tell lungu to sue the mastonline , LT and kambwili for calling him a corrupt theif……choncho ??? …….. You will notice I have not taken a position on that, I am a professional and not a tribalist like some so called “professors” in UP.NDonkeys, so I would rather the International Committee of Investigative Journalists conclude its work. My only argument from Paradise is the $14 million that U5 did not declare in 2016 which led to him committing the criminal offence of lying on oath. Please give me your comment in your new honest role of “Spaka like sensible”. Hh should be investigated and prosecuted if he has done any wrong….make no mistake about that…..let him explain his wealth and panma papers….and while we are on the topic net worth maybe you can tell how lungu accumulated $2.3 million after 1 year in office ?? What bussiness does he run that has such a high turn over ?? If they don’t pay back “chiwenga” them. One who hid his money in the ground got arrested but the other hid his loot in the Havens and still walking free. They say God of the day is the same God of the night. That is why we have selective justice in Zambia.. …the ACC should investigate and arrest HH , and we have a government that just looks on while Zambians wealth is being stashed away in off shore accounts ?? GRZ can you please arrest HH and let him explain his wealth and the Panama papers ??? Kwena being a PF cader is for those without morals…….the only thing they have on HH is privatisation and Panama papers, when you help them by insisting GRZ arrest and investigate HH on those , they scatter in all directions to take cover…..
Edgar Lungu will end like Mugabe. ECL breached the country’s consistution like his personal bedroom. He has no respect for rule of law. Please attach the deadline as well and let them pay back with interest. Before end of this year would be a reasonable deadline I guess. Now with this ruling it will be free for all, ministers will be stealing with impunity to pay back. Those with no more jobs like Chishimba Kambwili are in trouble. No cash cow, what next? If Ministers remained in office illegally, how legal are the decisions they made on behalf of Zambian people? I think we have wrong judges in Corncourt. These guys were made to stay by some authority and the penalty should have been on the authority that made wrongly made them stay in office. Wrong judges hand-picked by wrong hands!